I’m a list writer, an organiser & I like to have a plan… always. A 3rd child was not part of my big plan… not until I had my second baby and quickly realised that I certainly didn’t feel done with the whole reproduction thing, so, should we, shouldn’t we, if we do, when? I like to have a plan! I haven’t always been this way; pre surprise-first-baby I was scatty, unorganised & always a bit all over the place, my mind raced at 100mph & my body tried to keep up! I was easily excitable & always on the go. Having a child, a home & a schedule of my own made me realise how much I like being organised, throw in baby number 2 & my organisational skills are now somewhat advanced, if I do say so myself! 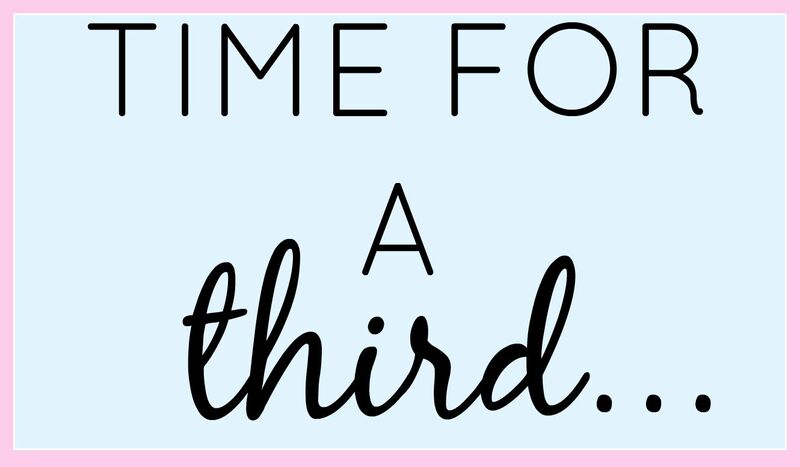 My days consist of routines, menu plans, nap times, organised play dates, shopping lists, colour coded washing piles & scheduled ‘working’ times – this is what I like… so for me there really is a need to know when to have a 3rd! lets forget the minor fact that my husband doesn’t particularly want a third child… tiny blip – he can be persuaded! I have found myself googling ‘when to have a third child’ & ‘should we have a third child’ faced with 173,000,000 answers to these questions that even super organised me can’t schedule in, I have taken it upon me to write my own break down. Wow reading that back, there really is no question about it – the ridiculous practicalities for not having a third child stand zero ground when faced with opposing answers that are so heart filled & solely centred on love. love concours all. When I look to the future I think of Christmas’s with a full house, the girls, their boyfriends in tow, hustle & bustle, noise & laughter. a full house, one that is never empty & one where the kids will always feel at home. I think that having a 3rd baby is not something you could ever regret, but you could certainly regret not having one. That my friends leads me to my answer… and hopefully yours too if you have found this via google search! Three can be exhausting but it is wonderful too -we love being a party of five! I do sometime worry that all three are getting plenty of time and attention but the beauty of it is , is that where I may not have the same one on one time that I did with my eldest, my youngest has older siblings to read the bedtime story or do a jigsaw with them. It is just part of being in a bigger family. The trickiest bit is how busy you become at weekends- It is pretty full on co ordinating 3 little peoples, hobbies, sporting activities, dancing, friends birthday parties etc etc and there is a lot of running about. I sometime find through the week more relaxing than weekends! That said I couldn't imagine it without three now -I love having a full house and there is always someone to chat to and have fun with or cuddle up too! You are right about holidays -they do change-once your youngest is out of cot sleeping age , most hotel rooms and apartments are a no no. Plus add in the fact that your older ones are now school age and holidays now have to be at peak time , holidays suddenly double in price.Villa holidays are your friend though! I read your list of reasons to have 3 and that could be my reasons to have 4 ..but I know that I have to stop sometimes and that my head says 3 is our magic number…..unless we win the lottery of course ! This made me want to cry as I never thought I would want a 3rd but now am in the same predicament as you. Our house is made for two, I worry about the cost of another, not even the direct cost of food etc but just the fact we would need a bigger house, a bigger car, bigger holidays. But i feel annoyed that my choice of having another is taken away due to money reasons. If there was no worry of money would i want one then? I dont even know. All i know is reading this has confirmed that i am unsure. Although i am pretty sure id want to be pregnant at the same time as you and Katie (^^) haha!! I only ever planned on having one! But now I have my son I want a million more, nothing is as amazing as having children! I was the oldest of 5, admittedly some are half siblings but having so many siblings is lovely. Go for it!